It was rainy and windy and horrible but I went out anyway. Really enjoying Strava as a way to keep accountable too. Makes me much less likely to dawdle out there. Running in the dark is really one of life’s great pleasures – particularly through the amazing Centennial Park. 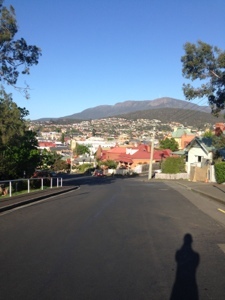 Hobart was a lovely place to run, great water and hill views, nice trails too. Downside though was lots of hills, and that usual slight confusion of not knowing exactly where to run in a strange city. Running while travelling is one of life’s great joys – the best sport ever and a great sightseeing opportunity. 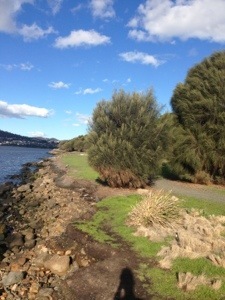 We went for a lovely run on a Friday morning taking in the Derwent River, the Queens Domain and the Botanic Gardens. Approximate track (and the way I will go next time) is below. Hanging in a field just next to Government House. Waterfront trail. Lots of birdlife on the river, and I spotted a very nice little falcon who came worryingly close. 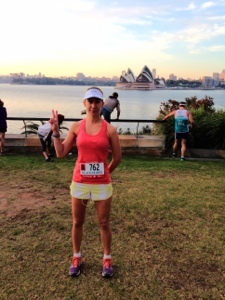 This was my second time running the Blackmores half, which I am quite sure is one of the prettiest races in the world. Every race plan starts with the carbs. Well actually there is the training beforehand etc but the carb loading is pretty important. My go to carb loading dinner in Sydney is Il Baretto. Their pasta as enormous and only $14. The places opens at 6pm which is perfect when your race is 6.15am the next morning. 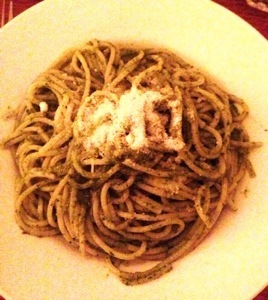 The pesto spaghetti this time was wonderful, though I do feel sorry for the other diners watching me shovel in my spaghetti. 6.15am race means breakfast at 3.30 am for me – went to my old faithful of an English muffin with honey and a sliced banana. Lots of good carbs in there. Then nap till 4.30 before hearing down to grab the train to Milsons Point. Transport thankfully included with race entry. Cold runners at the train station. The view at the start is pretty spectacular. Obligatory pre-race photos all around. 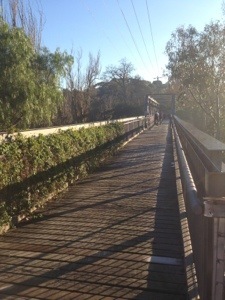 Was perfect weather for running, nice and sunny but with a cool breeze. Was glad to have a throwaway jumper at the start too, very breezy early in the day. 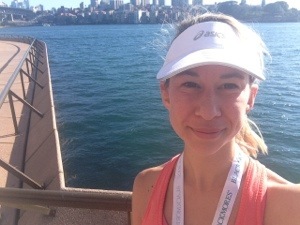 I couldn’t find a 1:45 pacer so ran with the Sydney Striders 100 minute pacers who were both very nice – kept nice steady pace, provided lots of encouragement and reminded all their runners to drink at the drink stations. Hadn’t done too many long training runs so started to feel a bit heavy around 15-16km but my homemade energy gel perked me up soon enough. Still, definitely doing more long runs before the next one. 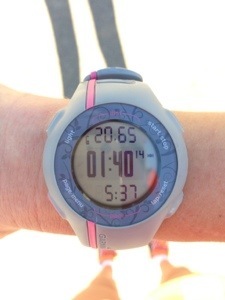 Was so excited to break 100 minutes that I forgot to stop my Garmin in time, d’oh! 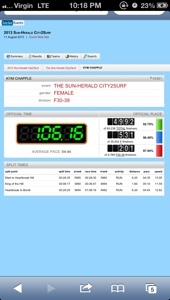 Thankfully race times went up on their website relatively quickly. 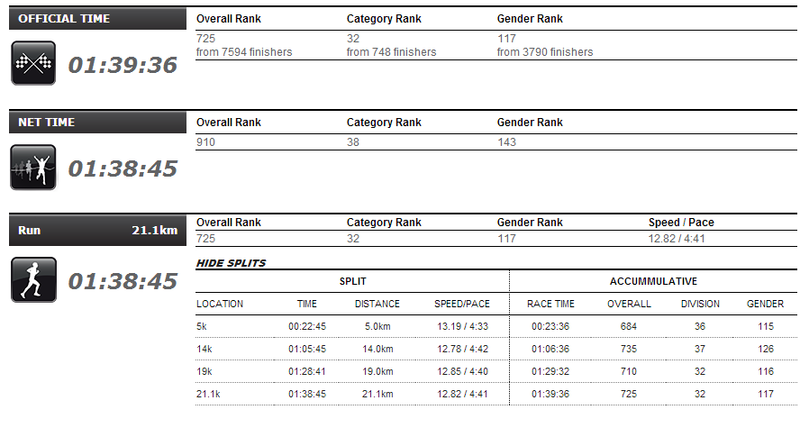 Pretty stoked with evenness of my splits (though the pacers are mainly responsible for this) and for getting 32nd in my category – woo! After the race had a banana and lots of water at the recovery village, then a very welcome outdoor yoga class from the lovely folks at Lululemon which ironed out the kinks in my hips and glutes. Thanks so much guys! 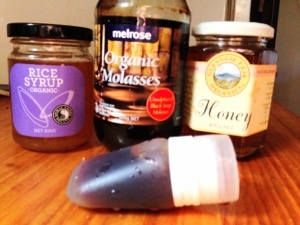 In anticipation of running the Blackmores half marathon tomorrow i’ve made a batch of my homemade gel – might be of interest to other hippie runners. I’m a whole foods lover, and try stick as close as possible to things that are not in packets, or have labels with only a couple of ingredients. 1. They were expensive. At $3-4 a pop fueling for a long run became a real cost. 2. They generate annoying sticky rubbish to either carry with you or try find a bin for. 3. They taste gross. I tried a few and frankly eww. 5. My stomach did not like them. At all. So I did what any sensible person does: I asked google for alternatives. There are quite a few sites with complicated recipes involving powdered this and that – but I wanted something as close to a real food as possible. It’s pretty tasty, you mainly taste the honey but the dark mineraliness of the molasses comes through too. I carry this in a little squeezy tube that I got from Paddy Pallin. In a half marathon this is sufficient with a generous squeeze into my mouth every half hour. In a full I use homemade energy drink for the first half, then water & homemade gel the second half. The three ingredient jars cost less than $20 from the health food store & make tons & tons of gel. 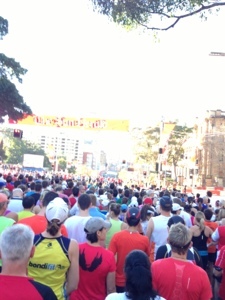 According to my calculations this was my 21st City to Surf. Yes, I started young. It’s a constant in my year, something marked in my calendar months in advance. The City to Surf from Hyde Park to Bondi is Sydney’s best known race, the world’s largest and probably prettiest fun run. 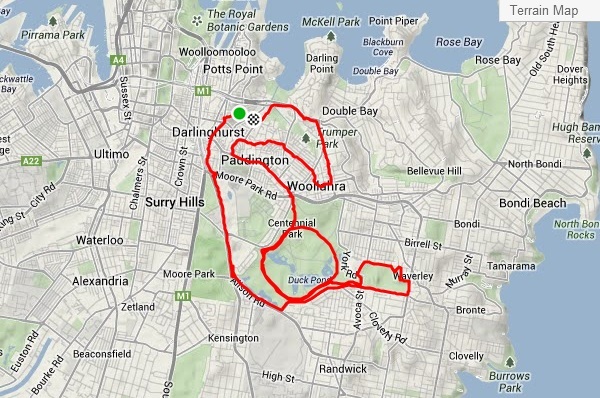 It boasts a killer hill – the eponymous heartbreak hill, and even better views across the harbour and ocean. It also is almost always the most gorgeously sunny winter day, and this year was no exception. – much greater detail about times & splits – in the old days used to have to wait for the pullout in Tuesday’s Herald & scan hundreds of names to find yourself, now it’s online the evening of the race. 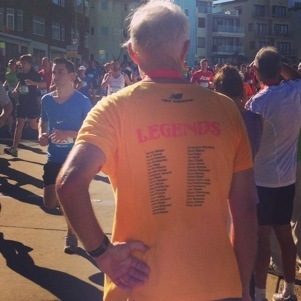 – the amazing “Legends” who have run every race since 1971. Still running. One thing that has definitely changed, my time.. 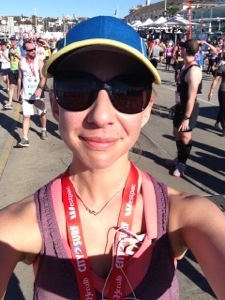 When you’re a tiny 9 year old who didn’t train you set times that an adult training for a half marathon can smash, woo! From 121 minutes then, to 66 minutes now- boom! 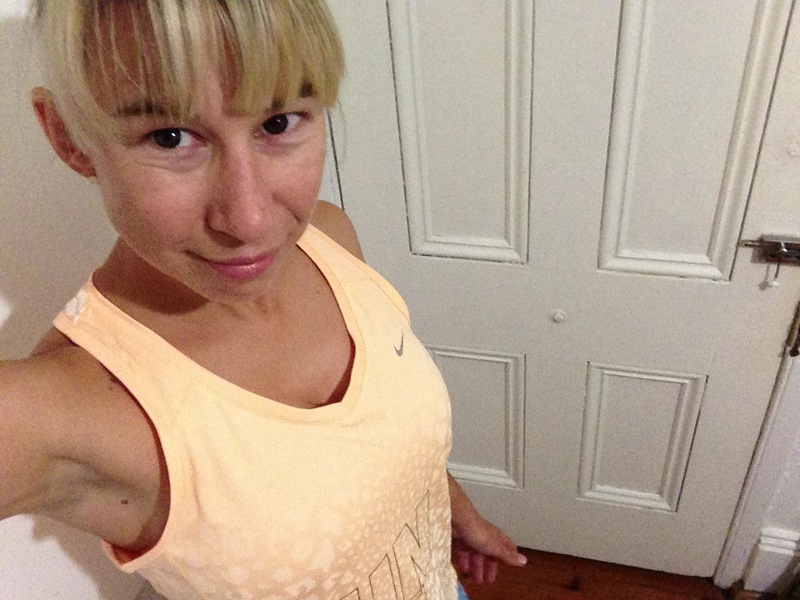 4 May 2013 was the second ever Nike She Runs the Night in Sydney. The race last year was 13km but was brought down to an even 10km with an adjusted course that was thankfully less like running spaghetti than the 2012 course. The race packs for the event had to be collected in person a few days before the event from the Nike She Runs pop up store near the Broadway Shopping Centre – convenient for me, but not that easy for people outside Sydney. Race entry is relatively steep at $85 but does include a quite swish top, and a metal water bottle at the end of the race. Useful race goodies are the best! Enough medals and shoe bags already. You could also pay $195.00 which would have included race entry, the singlet or tee and a pair of new shoes. which will get you a top and a choice between three different pairs of shoes – cheap way of getting new runners if Nikes work for you. There were three pace group based starts and you self allocated into them with fastest being cheetah, next being lioness, and slower being tigress. I chose the cheetah which seemed overly optimistic, but ended up working out quite well. This is only the third night race I have run, it’s hard to work out your fuelling and getting ready strategy but I found a late lunch then an afternoon english muffin with banana and PB hit the spot nicely. The set up in Centennial Park was pretty impressive, the shirts glowing in the dark, the lights everywhere guiding you to the bag drop and stage area and the brightly lit tunnels set up for pre-race selfies. Bag check worked smoothly with paper wrist bands allocated with numbers to identify bags. All runners had wrist bands that flashed when it was your group’s turn to head to the start – no bibs either, just shoe tags. The Late Minute stand had hair ties and glow sticks and other handy things you might need before the race. The run itself was pretty smooth, not much of a crowd about, relatively regular water and gatorade stations. Most of the course was bright enough to see where you were going and avoid any trip hazards, there is also a kind of magic about running through a park at night with thousands of other women. The course decorations of giant flares, fairy lights and fields of glowing dots were pretty great too. 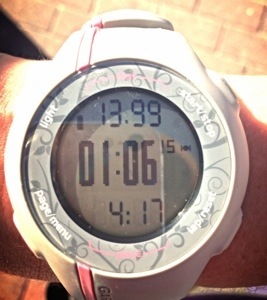 Time ended up being a PB – first time I’ve run a 10km race though so this was guaranteed! The lovely Veggie Patch Van at the finish for a vegan burger was the icing on the cake. Running cities other than your own can be an unnerving experience where your internal compass is out of action after a few turns. Luckily my fruit phone can lead me back to home base but I often favour an out and back to avoid getting too lost. Early morning Melbourne is perfect for a run, the city is slow to wake on weekend so you have the streets to yourself a fair bit. If you’re like me you will also have gorged on delicious cheeses & things and will really feel like a run. I ran from Collingwood to the Yarra River Trail and then backtracked – ended up being about a 12km out and back, perfectly flat and gorgeously crisp. 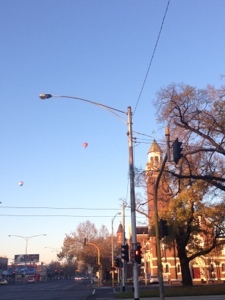 Hot air balloons in the distance were a lovely surprise. 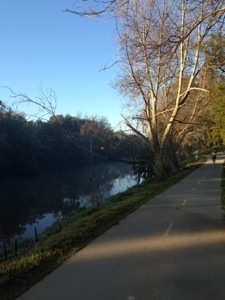 Running by the Yarra – not pictured are the rowers gliding along the water looking very cold. This trail is quite windy so easy to get decent distances without ending too far from home. 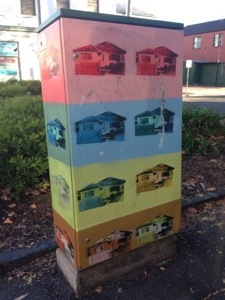 Incidental benefit is seeing some of these great painted traffic signal boxes that reminded me of the ones we have over here in Paddington/Woollahra.